The ladies of The Mary Tyler Moore Show are coming together for a special episode of Hot in Cleveland on TV Land. 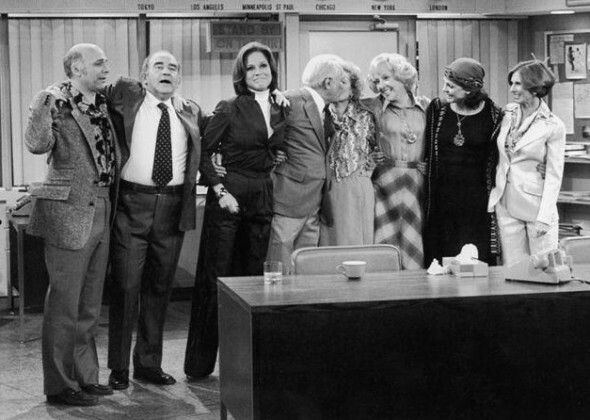 This will be the first time that Mary Tyler Moore, Valerie Harper, Cloris Leachman, Georgia Engel, and Betty White have been on the same sitcom since MTM said goodbye in 1977. What’s more, it will be the first time that they’ve all acted together in the same scene. That never happened on The Mary Tyler Moore Show. According to Deadline, the special episode of Hot in Cleveland will film on April 5th. Elka (White) and Mamie Sue (Engel, who’s been recurring) decide to reunite their bowling team, named GLOB; The Gorgeous Ladies of Bowling. Apparently the five women had a falling-out after their championship season went to their heads. They reunite with former team members Diane (Moore), Peg (Leachman), and Angie (Harper). The reunion news follows Harper’s announcement that she has terminal brain cancer and doesn’t have long to live. Hot in Cleveland has just been renewed for a fifth season of 24 episodes. The rest of the fourth season episodes (including the MTM reunion) will start airing on June 19th on TV Land. What do you think? Will you be tuning in for this special episode of Hot in Cleveland? Wouldn’t it be nice if Ed Asner and Gavin MacLeod put in a cameo? It really shook me up when I heard about Valerie Harper’s latest health condition. I always admired Valerie Harper. I remember watching her when I was a wee lad watching MTM on Saturday nights with my parents, and on Rhoda. I think Valerie was the best supporting cast member on MTM. She’s an incredible actress. I always liked Valerie even when I was so very young. I only want to wish Valerie my very best and I truly admire her for her courage. What a fabulous soul. A beautiful lady inside and out. Bless you Ms. Harper! Wouldn’t miss this for the world!